Andrew was a featured speaker at this year’s Social Media Inside the Large Enterprise event as part of Social Media Week London speaking on how enterprise social media makes good business sense for organisations. You can watch a replay of the panel below. Follow the discussion via the #SMWSmile hashtag. The second SMILE conference was held in March 2013 introducing key themes; laying down a business case, choosing the right platform. We heard from early adopters and pioneers who shared the successes and the lessons learnt as they launched their new platforms in companies such as Diageo, Philips, SAS Institute, Cable & Wireless, and LexisNexis. Having the technology in place does not guarantee success. Internal communicators need to prise their internal social media out of IT and into comms as well as developing a communications strategy for launch and roll-out. 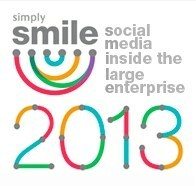 The next SMILE event we will continue on the social media journey. Do any of these issues sound familiar? How do I choose the right platform? How can I turn middle managers into advocates who will champion rather than block my new network? How can I mean colleagues off email and on to collaborative digital tools? What should I do when a controversial issue goes viral? What should my social guidelines say? How do I develop a strategy to breathe life into a dormant platform? Are anonymous postings a good idea? What do I do about the great unwired in my company? Which tools will really help me to measure success? Tickets are just £50 +vat +£1.90 booking fee if you work inside a large organisation with more than 1,000 employees. If you are a consultant or an agency you can still attend by applying for an Agency ticket at £345 +vat and booking fee of £6.50.